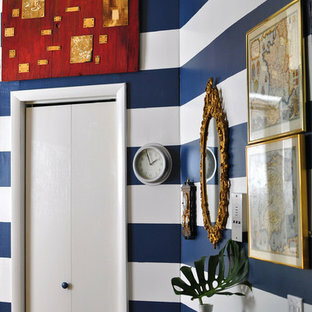 "painting horizontal stripes on a wall"
This is an example of a bohemian hallway in New York. 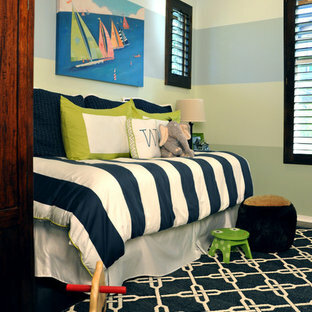 Design ideas for a nautical kids' room for boys in Orange County. 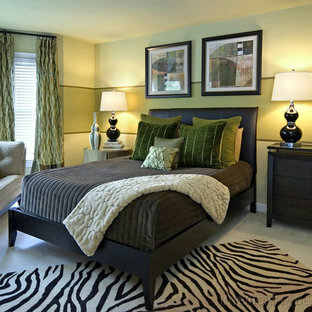 Inspiration for a traditional bedroom in Los Angeles with multi-coloured walls. 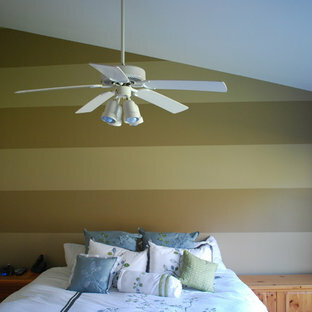 Horizontal stripes with a vaulted ceiling. This is a great way to add some fun & character to a bedroom. Design ideas for a traditional bedroom in Chicago. Inspiration for a medium sized traditional shower room in Newark with a pedestal sink, a freestanding bath, a shower/bath combination, a one-piece toilet, beige tiles, ceramic tiles, multi-coloured walls and ceramic flooring. Inspiration for a medium sized traditional shower room in New York with a pedestal sink, a freestanding bath, a shower/bath combination, a one-piece toilet, beige tiles, ceramic tiles, multi-coloured walls and ceramic flooring. Medium sized traditional shower room in New York with a pedestal sink, a freestanding bath, a shower/bath combination, a one-piece toilet, beige tiles, ceramic tiles, multi-coloured walls and ceramic flooring. 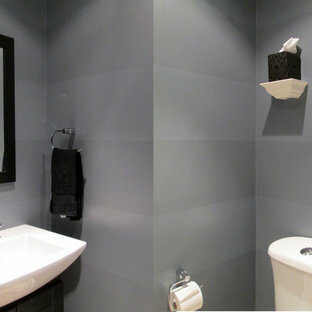 Photo of a medium sized traditional shower room in New York with a pedestal sink, a freestanding bath, a shower/bath combination, a one-piece toilet, beige tiles, ceramic tiles, multi-coloured walls and ceramic flooring. By Gibbon Lawson McKee Ltd. Contemporary single-wall open plan kitchen in Edinburgh with a submerged sink, dark hardwood flooring and an island. Decals available at my etsy site. 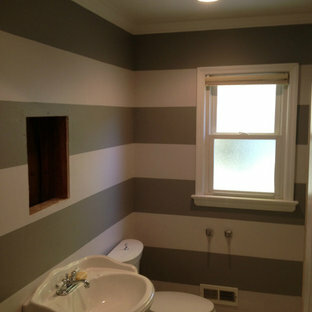 A fun legos inspired room I painted for Atlanta designer Dawn Kines. I love how my painted bricks play against the Mega blocks Dawn used in creating this amazing headboard. 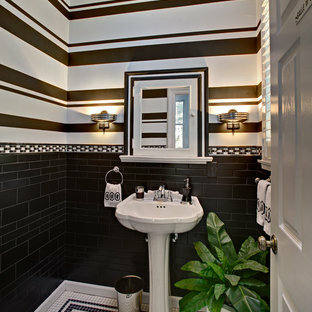 The black border is a great anchor color for the room. This stylish and playful design would also be great in a playroom. Modern, fun and colorful. Everything is awesome...:-) The painted border is two feet wide. The pockets on the custom bedding would be great for stowing pj's! Decals available at www.anitaroll.com. This is an example of a contemporary dining room in San Francisco with dark hardwood flooring and multi-coloured walls. World-inspired bedroom in Orange County with orange walls. Traditional children’s room for girls in Dallas with carpet and multi-coloured walls. Custom painting in nursery. 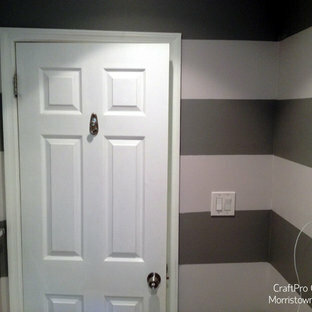 Horizontal striped accent wall. Photo of a contemporary home in Philadelphia. Inspiration for a traditional kids' room in Detroit with carpet and multi-coloured walls.